A small, relaxed, Dordogne riverside campsite with canoes to hire and safe swimming spots. Wild yet well organised with a fantastic location. Wild, eco-conscious glamping on a working dairy farm, surrounded by the brooding Yorkshire Dales. Riverside camping on the banks of the Yonne by the famous Roches du Saussois cliffs – the perfect family base to explore the Burgundy region. Nestled at the foot of the famous Roches du Saussois rocks and on the banks of the River Yonne, this riverside family campsite in Bourgogne with excellent modern facilities, is the perfect base to explore the Burgundy region. 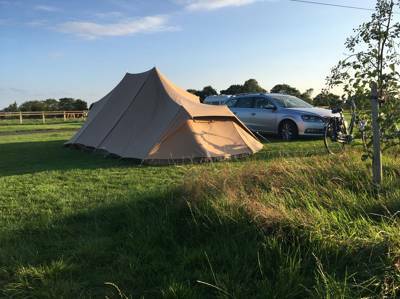 Simple tent camping in the farming village of Damerham with easy access to England’s favourite natural playground, the New Forest. Views of Dartmoor and easy access to the treausres it holds. 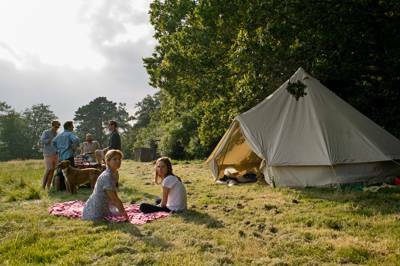 10 acres of blissful bell tent and gypsy caravan glamping near Thetford Forest in Norfolk. Traditional family camping and bell tent glamping on a working fruit farm, two miles from the beautiful inlet town of Sandwich in Kent. Going glamping with your dog? Why leave your pets at home when you go on holiday? Here at Cool Camping we're all in favour of pet-friendly glamping sites where dogs are welcome too and if you've come here in search of a glamping site where you and your pooch can holiday in peace, then you're certainly not barking up the wrong tree. 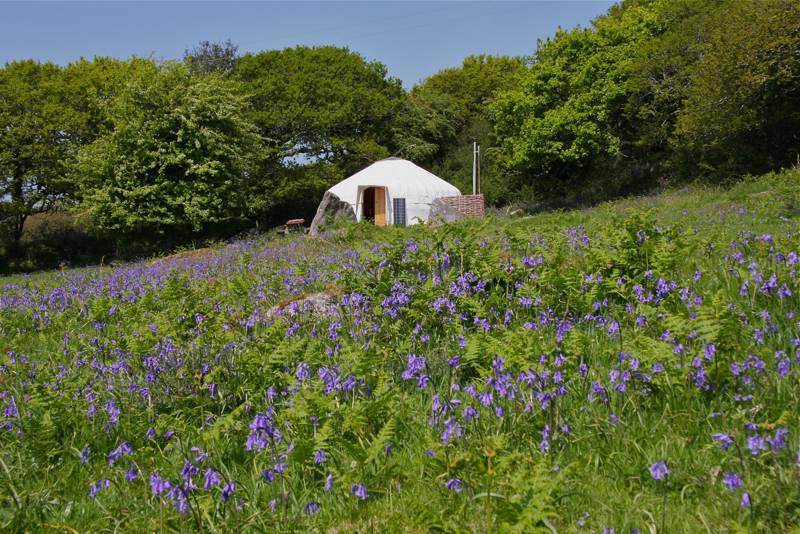 From magnificent Mongolian yurts where your dog will have his very own bed to spacious summer bell tents where pets are all part of the fun, we've brought together all the best dog-friendly glamping sites in one place. Whether it's England, Wales, Scotland, France or elsewhere in Europe, we've got our finger on the dog-friendly pulse. So what are you waiting for? Pack the doggie treats, stick the water bowl in the back of the car and book one of our chosen glamping sites now. Your next dog-friendly adventure awaits! There are loads of great reasons to go glamping with your dog. For starters, of course, there's the simple fact that no one likes leaving man's (or woman's) best friend at home – especially when you take into account the faff of finding kennels or someone to look after your pet for you. Then there's the joy of having the company of your dog while you're actually on your holiday. Waking up to your pooch beside you, spending the day walking on local footpaths or roaming on open beaches, while your dog runs wild. It's all part of the fun. It's for this reason that, sometimes, glamping in winter is just as appealing as glamping in the summer months. During peak school holiday season, popular locations like cornwall will often have lots of restrictions, which mean you cannot take your dog to the beach. Come winter time, however, and the rules become more relaxed. There's more space and no body's lying around sunbathing, so dogs can rule the roost once more. Hooray! Dog-Friendly Glamping Accommodation: What's Right For You? A dog’s joy at being let loose to play in a field is unparalleled, with exciting, places to discover and a chance to run themselves ragged. But when it comes to settling down for the night, there's no one single form of accommodation that is better than any other. In fact, when it comes to glamping, there is a wide range of accommodation out there, with the choices growing and growing every single year. Not all glamping sites will actually allow your dog inside your accommodation. Some will provide a small kennel alongside. However, at most it will be a proper sleep-at-the-foot-of-the-bed job, where your pooch is very much a part of the proverbial furniture. 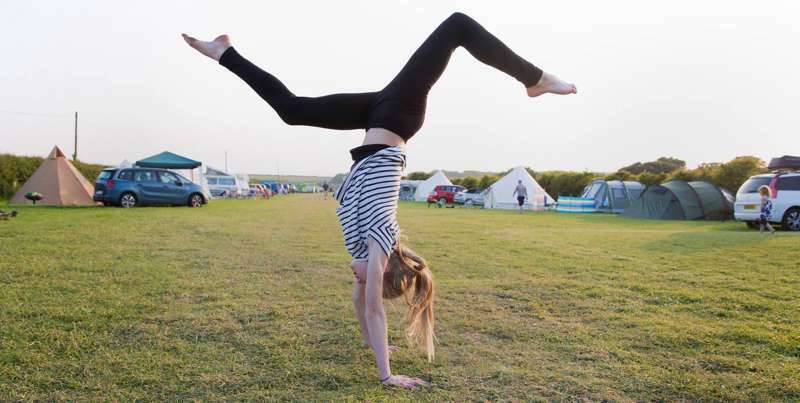 Here at Cool Camping we've found bell tents to bark from and paw-friendly pods that are open all year round. So, whatever you're after, there'll be a glamping site to suit. Generally speaking, it's best to begin by considering how much you are willing to spend on your glamping holiday and also the time of year you expect to be travelling. If you're glamping in summer, large, family-sized safari tents are always a popular option, with different rooms and a veranda outside where you and your pet can soak up the sun. In winter, however, it's best to look for something better insulated. 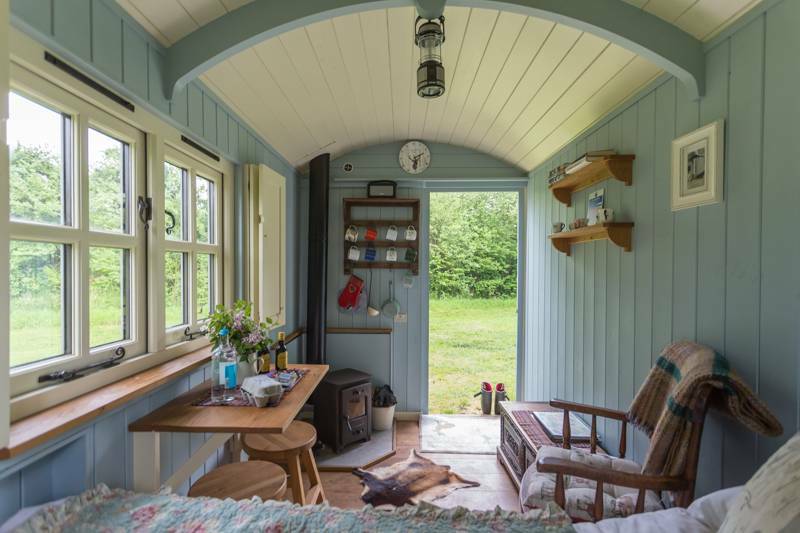 Shepherd's huts are a wonderfully romantic option – your mutt can play sheepdog for the weekend, while you enjoy evenings huddled around the wood-burner – and gypsy caravans also have a similar feel. Not every form of accommodation can be pin-holed under a specific title however. We've found converted London buses, ingeniously up-cycled shipping containers and leafy treehouses that'll have your dog howling at the moon. 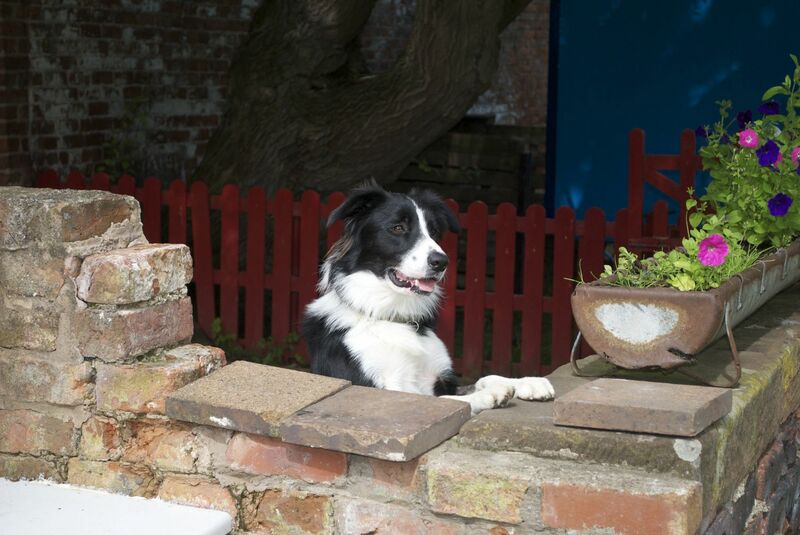 Whatever accommodation gets your tail wagging, you'll find it here on the Cool Camping website. Who'd a thought it? It turns out dogs love the countryside just as much as we do. With space to run wild, new patches to sniff and new people to make friends with, glamping holidays in the UK are always a big hit with our furry friends. Here at Cool Camping we've been all over the UK and, more often than not, we've had our pets in tow. Whether it's England, Scotland or Wales, we'll have been there and got our paw-stained t-shirt so that, now, we can bring all our favourite glampsites together in one easy online space. Every glamping site on the list below has had a big thumbs up from a member of our team and their poochy compadre. So, rest assured, if you follow our recommendations and book a site with us, you'll be guaranteed it's not only the best price but also a truly incredible place to stay. 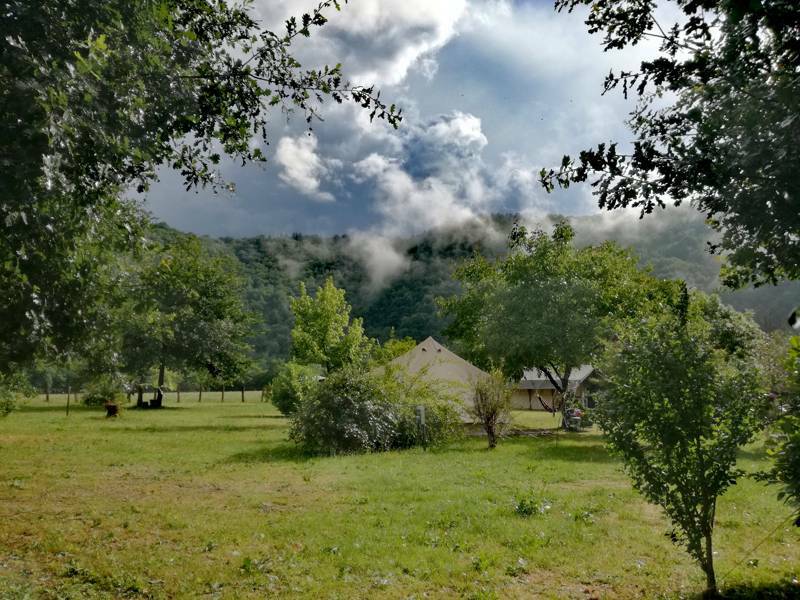 Thinking of going glamping in France? We don't put down our chew toy and curl up in bed when exploring the UK is over. Oh no. We've also been out on the road – head out the window, panting in the breeze – exploring the rest of Europe, with heaps of options across the channel where your dog is also allowed. Flights, ferries, high-speed passenger trains and tunnels for your car, there are more ways than ever to get across the water to France and mainland Europe and nowadays taking your pet with you is super easy too. Provided you have a pet passport and the required vaccinations, you can now travel to mainland Europe with a minimal amount of hassle and the upshot is easy holidays abroad with your dog. We love it and our pets love it too. We've been to France plenty of times before and members of the Cool Camping team have also been glamping in Spain, Italy, Germany, Portugal, Austria and more. For the best glamping sites in Europe, you're in the right place and every single one on the list below is pet-friendly too. So take a browse and find the location that you and your four-legged friend will love. Who knows what glamping adventure awaits? Dog Breeds: Which Breeds Are Allowed? 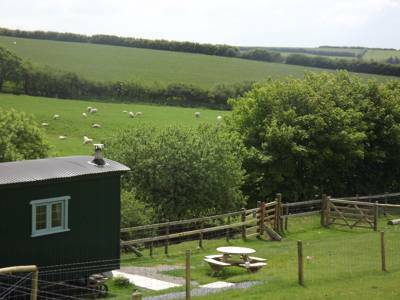 The vast majority of dog-friendly glamping sites we recommend will allow all legal UK breeds of dog. 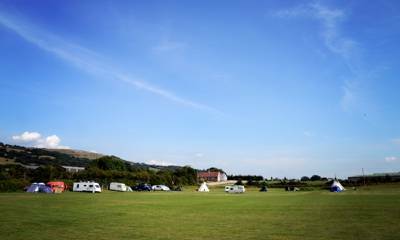 There is, however, the occasional exception, as some glamping site owners choose to restrict certain breeds such as rottweilers, bull dogs and other short-noses breeds. Where possible we have always specified that this is the case under the Who's In? heading but, if you have any doubts about whether your breed of dog is accepted, then we recommend contacting the glamping business directly and asking for further details. All the glamping sites we recommend have had our personal approval and we know that the folks there are friendly and helpful. So just give them a shout and ask them for further information if it's required, they'll always be happy to let you know. – Extra energy for all those walks! frankly we can't bear to leave them at home and a holiday just isn't a holiday without bringing our pampered pooches along. Whether it's a bell tent break or a yurt retreat, we know that the freedom of living in the great outdoors is something that our dogs love just as much as we do, so, if we're going to be enjoying the countryside you can be sure they'll be coming along too! 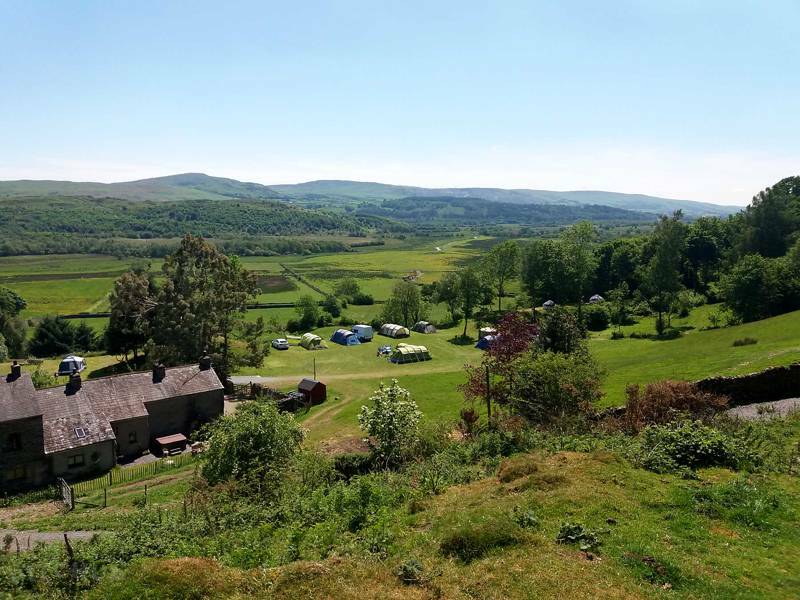 Dog friendly glamping sites, pet friendly glamping, dog-friendly, pet-friendly, pooch, pet, dog, mut, mutt, doggie, at Dog-friendly Glamping Sites, Going glamping with your dog? Discover Cool Camping's premier collection of the best pet-friendly glamping sites that welcome dogs in the UK, France and across Europe now. From Hampshire to Powys, Monmouthshire to Aquitaine, Cool Camping have a dog-friendly glamping site for you.